The Escape Hoods are individual filtering type protective device for self-rescue with a built in face piece and equipped combined filter. Due to its special construction, the hood protects the eyes, respiratory organs and the head of the wearer against decontaminants, being dangerous to the health, enables the wearer to have a correctional eyeglass inside. The quick-closing headbands ensure the proper fastening of the hood. The hood has an elastic yoke on the neck. The shatterproof, antifogging panorama visor gives a clear, almost total field of vision. The two exhalation valves of the built-in half mask make the exhalation easier and comfortable. Material of the hood: PVC coated cotton fabric, which is not only self-extinguishing and resistant to chemicals but provides comfort feeling to the wearer. Material of the of visor is 0,5 mm optically clean PVC. Material of the half mask: natural rubber, containing no ingredients likely to cause irritation or any adverse effect to the health. The use of the hood does not require any special training, after tearing the protection bag /place of tearing is shown on the bag / the hood has to be pulled on the head, the half mask is to be adjusted to the face by pulling simultaneously the two head-bands equipped with quick-closing. Way of usage is shown by pictographs on the packing. The Escape Hoods cannot be used when the oxygen content in the ambient air is less than 17%, which is often the case in closed spaces such as wells, tunnels, cisterns, etc. By increasing the concentration the efficiency of protection decreases rapidly. The Escape Hoods are single use products, it is forbidden to repair or repeatedly use. 5 years, only for undamaged, intact, originally packed hoods. Protection /breakthrough/ time: at a concentration of 1000 ppm against cyclohexane, sulphur hydrogen, chlorine, hydrogen cyanide, ammonia, sulphurdioxide according to EN 141 Standard /DIN EN 14387:2008/. Particle filtering efficiency: protection capacity against solid and liquid aerosols meets requirements of P3 class of DIN EN 143:2007 standard. The product is CE certified, tested by the German BGIA on basis of DIN 58647-7:1997, ABEK P15. Individual packing, sealed, aluminum foil welded bag in a portable carton box with pictographs on it for use. Groupie: 20 pcs small box. The Escape Hood serves for escape purposes from the dangerous area in case of nuclear accidents and catastrophes. Further on serves for quick escaping of population from the contaminated territories. The hood provides protection: against radioactive iodine and methyliodid as well as against radioactive dusts and aerosols. The Escape Hood does not have protection against carbon monoxide /CO/!! Device class: "S"
Protection /breakthrough/ time: min 30minutes at a concentration of 1000 ppm against methyliodid and radioactive iodine according to DIN 3183-3. Particle filtering efficiency: protection capacity against solid and liquid aerosols meets requirements of P3 class of EN 143 Standard. Protection capacity of the Escaped Hood meets requirements: S class of EN 403, DIN 3181-3:1994 and TB 4240- 00532 Anhang 9 as well as EN 141 Standards. The Smoke Hood is filtering device with hood for single use only and for short duration, minimum 15 minutes, for self rescue in case of fire. It serves for personal escape from particulate matter, carbon monoxide and other toxic gases produced by fire. Designed to be carried on the person in a shoulder bag, the filter is not replaceable by the user. Device class: "M"
Certified according to DIN EN 403:2007 and complies with the provisions laid down in the directive 89/686/EEC (Personal Protective Equipment), amended by the directives 93/68/EEC, 93/95/EEC and 96/58/EC. 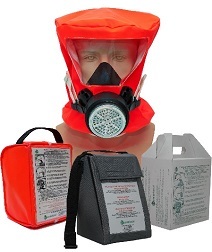 The filtering smoke hood is welded into an aluminum foil bag and packed into the shoulder bag with Use for Instruction.